Just a few finds to report. Some are from My Favorite Place. Keith and I were in north Atlanta on Saturday test-driving double strollers (isn't he a great sport?) and he offered to go to MFP with me. The silver rattle and candy dish are from my mom. Thanks, mom! Love your finds (I have the same candy dish)! I saw the globe-looking piece before and am kicking myself for not picking it up! I also saw the globe piece before and didn't get it, but I have the wide mouth, scalloped edge piece. How much did you pay for these? oooh great finds! Will you display them all or use all/some of them? The rattle is so cute! Did you check out the city select double stroller? Anon- I normally pay $1-$3 per piece. Seems to be the going rate. Lovely - I am working on a way to display them right now.....hopefully I'll have it together and be able to share it soon! Small and tall - I think we're sold on the city mini double. I pushed it around and played with it and love it. Thanks for the recommendation. Baby Joggers seem to be great strollers! 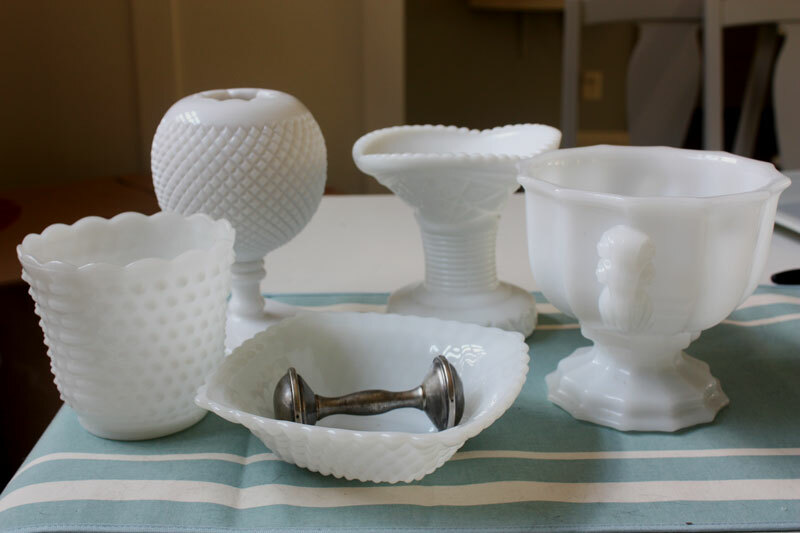 Oh I LOVE milk glass! I have the piece on the far left...my husband and I hit up thrift stores and garage sales and collected over 75 milk glass pieces for our wedding. We kept all of our favorites, and I can't wait to display them in our new home! Just found your blog via the nester's. You have such a great style! LOVE your nursery! Greetings from Norway! Just found your blog. I think I may be in love . . . The nursery is gorgeous! I am a new follower! Where is My Favorite Place in atlanta? Everyone, thanks so much for the sweet words. I love getting such kind comments! It's so exciting to hear about other families that are adopting and have made it that far. It definitely gives us hope!